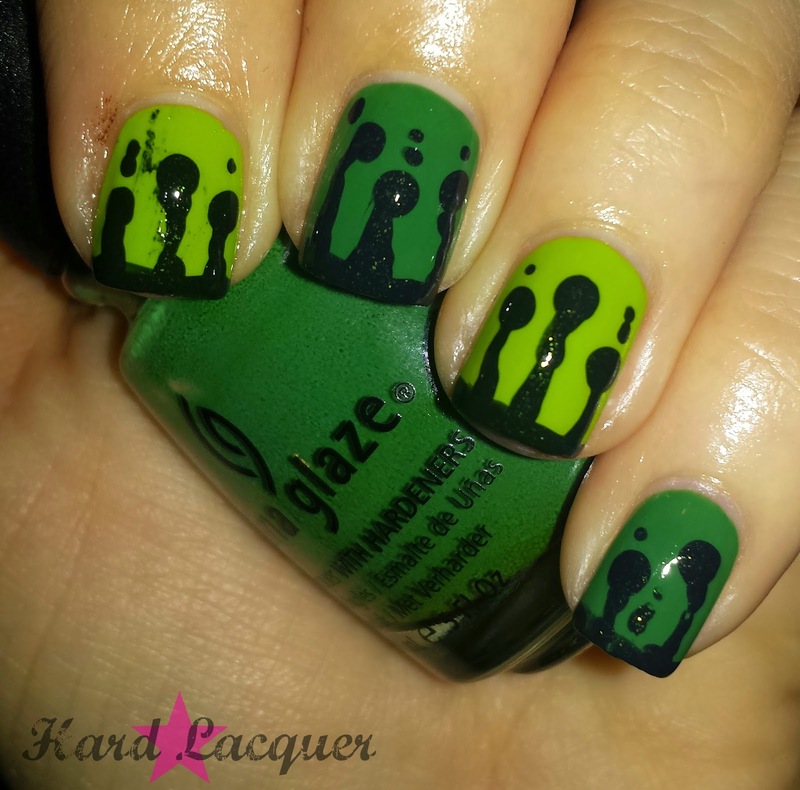 Heather Giustino Blog: Mani Monday - luck of the Irish! Mani Monday - luck of the Irish! Happy Mani Monday, loves! Today Glitter and Gloss's monthly nail art contributor, Tiffany is sharing some great, GREEN nails! For this design you just need some polish, dotting tools and the regular cleanup supplies. I used China Glaze Def Defying (chartreuse), China Glaze Starboard (grass green) and OPI Live and Let Die (deep sparkly green). 1. Paint the nails, alternating the lighter greens on each nail. I used 2 coats. 2. Use the brush in the bottle to apply the darkest green polish to the tip of the nail, and use a dotting tool to put 2-4 larger dots on the nail (see ring finger). Then use a smaller dotting tool dipped in the same darkest green polish to drag the drippy lines from each dot to the polish at the free edge of the nail. Then use an even smaller dotting tool to add a few extra drips where needed. 3. Use a top coat on all nails to seal in and protect the design. Be more careful than I did to avoid that index finger fiasco. And you're done! Obviously, this can be done in many different color combos (one of my favorites was turquoise and neon orange!) and everyone's drip designs tend to turn out a little differently. It's not a very precise design so just have fun with it! See ya'll next time! Love it, Tiffany! Now it's YOUR turn to link up! I can't wait to see your gorgeous nails, and as always I'll be pinning my favorites!